We picked five artists from”Hyper Mesh“, Assembly Point, London and asked them five questions about their work on view. 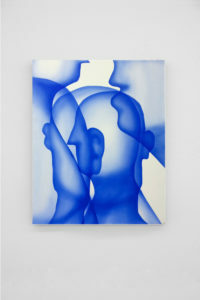 “Hyper Mesh“, Assembly Point, London, a group show curated by Alice Bonnot, which explores contemporary notions of identity, and sets out to examine how identity structures could be re-imagined or reconstructed. Inspired by the idea of an interconnected network, the exhibition offers multiple interpretations of identity, from the geological to the administrative, the personal to the global. ‘Alex’ is a one-year experiment that attempts to create a human being, and all the aspects that make one exist in society. To create ‘Alex’, I worked with a team that included a psychoanalyst, a lawyer, an anthropologist, a scriptwriter, a stylist, and an interpreter. After one year, ‘Alex’ had an administrative and social existence, a bank account, rented an apartment, and had friends. This process and Alex’s life is mapped through videos and objects in the installation of the project. The project starts with a distance taken from reality, a sensation that all is so complex, our behaviour, our societies, our feelings… Anyone can feel this, it’s a vertiginous sensation, but I decided to try to make this question become a collective research, and ‘Alex’ is the experiment of it. He deals with questions anyone can have on how we become the person we are. First of all, the project is a collective experiment, and it started with looking for ‘Alex’, so I met people, and constituted a group that would be around him (I met most of them by an announcement to search for ‘Alex’). Every week, we had meetings to think what ‘Alex’ would have to do to exist. We met new people, and we lived adventures. I filmed the process of thinking this. The objects and images that appear on the furniture, of people sat to watch the video, were collected all along the making of ‘Alex’. As any project, the struggle was first to just start to do it, and then to invite people to believe in the project enough to make it with me. These little doubts could be felt all along the project, when people would ask ‘Alex’ about his past, when we had to fill forms… Alex encountered many struggles, and it always made us go ahead : he had no address, no family, no nothing, so we had to find solutions to meet people, to live. Some people didn’t trust the project, and they took distance and progressively left us, but some others helped him a lot, it was like a real person who would built affinities, meet troubles. Struggles were absorbed in the process. The project was to give a practical and collective dimension to this question of the building of the Self in society. I tried to create a kind of space that is neither a fiction or a reality, just a space where we can try and think, without having the excuses of the fiction or the pressure of reality, a kind of counterfeit. ‘Ban’ is a series of different flags. Here, France and England, made out of silicone, tinted with pigments simulate the colour of the skin. Used for prosthesis as well as for film production, this process, associated with the patterns of flags, evokes the violence that national identity imposes on one’s body. Each fragment of our planet, from an island to the smallest piece of packed ice, drifts into the bosom of a nation-state, from which it is impossible to extricate ourselves, except to immediately enter into another one. This assimilation of people and cultures under a single banner has always been by force: gun or scalpel. A transplant taking place here, is an amputation done there. To escape this scheme is to be relegated to the rank of stateless people whose camps have flourished all around the world these former decades. There, time stretches from temporary to eternity. According to Zygmunt Bauman in his book, ‘Liquid Times’, these inhabitants are residues of society, “human waste”, kept away just as household waste or radioactive waste. Thousands of them also just disappear in the oblivion of the Mediterranean sea, like they have never existed. ‘Ban’ refers to moults as an old way to conceive one’s identity, what’s left behind after emancipation. 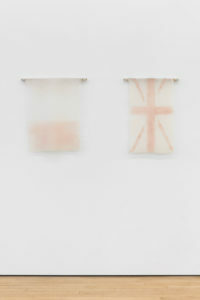 Those flags are mould on synthetic leather, the silicon taking the form of all the asperities, imitating skin and flesh. We also used different adhesive plastic ribbons to create different kind of textures. The silicon is slightly tinted with pigments, simulating different skin tones and flesh. We kept it really translucent and clear, so it refers to moults. How to talk about a rather hard subject, like political migration, and to talk about people like refugees, when we all know the horrors they’re going through, to finally be persecuted in Europe by police and laws? As European artists, we chose to focus on the important symbols flags still are, especially in France, and which has to be left behind. It also reflects some fear that we feel about this item, when fascism is crawling through Europe. Presenting flags as dead skins is a way for us to fight those fears by mocking them. The two works on show are partly based on items from the Mutter Museum’s collection of swallowed objects, a collection of ingested objects recovered by Dr Chevalier Jackson, who meticulously catalogued his recoveries. My sculptures have incorporated distinctly human belongings, things that we dispose of or lose, remnants that relate to people. Colour or texture, appearing geological, is made from foodstuff you may find in a kitchen cupboard. These ingredients relate to holistic remedies used to treat aches, pains, and aliments. Part geological strata part layer-cake, the works are chunks of matter that imply a larger body. I would hope that the casting processes and the resulting forms draw parallels with the removal of materials on an industrial scale – like quarries and tunnelling – as well as burial, like grave cavities where people are places which turn to bone and soil. These sites are where our peripheries physically morph and break down into soil, sustenance for vegetables and animals, and a material marker of our memory as a once living being. The works deal with internal and external, in terms of the body, display and production – architectural rear spaces, and hidden bodily activities or situations that are brought into view through specific objects, textures or forms. The works were made using basic casting and metalwork techniques. The metalwork sections are made from welded mild steel and laser-cut aluminium, and the cast blocks are made from plaster, jesmonite, cement, oak, as well as stranger materials such as bird grit, turmeric, poppy seeds, ash and paint. The struggles of making it were technical. 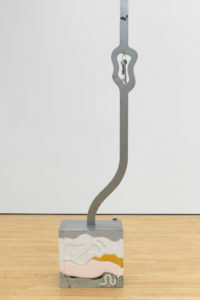 The metal armatures were complex and fiddly, because the curves in the frameworks could not be achieved using standard metal bending equipment. This meant that I drew the profiles on a computer instead, and a laser-cutter copied these exact shapes, cutting them out of sheet steel. It was made into the hollow square section by welding flexible strips onto the sides, to follow the curves of the drawing, and to make it a complete unit. We needed lots of clamps. I want it to function like the way your tummy rumbling makes you suddenly think about the shape and actions of your gut. Digestion, swallowing, and spices centres the work at the intimate site of the mouth and deep in the sensation of the belly, but this kind of food is to be chewed in the mind instead of the mouth. Like the board game of ‘Operation’, the body is opened for us to poke and prod at its cavities. It is a painting, made with acrylic paint on canvas.  It is 55 x 67.5cm, and is various shades of ultramarine blue. I was interested in exploring certain illusionary qualities that paint can achieve, specifically the illusion of weight, or lack thereof. I drew with a scalpel and masking tape (tesa brand – good stickiness for canvas, and you can see through it when drawing) and used an airbrush with golden fluid acrylic paint in it. I had a fairly clear idea of what I wanted to do at the start, but the doing takes a long time with this way of painting, there’s a lot of admin, as opposed to actual paint on canvas time. Disregarding more personal connotations of the imagery, in direct terms, I wanted to juxtapose images of objects of a supposed weight with the transparent nature of their application. between them and with the viewers. 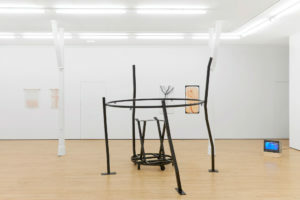 The work gets manifested through two ways: an installation comprising of moving image, sound and sculpture, and also though a live performance, where the characters and their voices are mediated through living bodies, within the sculptural elements that their world is within the context of the group show at Assembly Point. ‘Angels Like Buildings’ deals with the existence of these other creatures, that are part human, part animal, part spirit, part building. Through their voicing of being – which takes place in and out of their bodies – the work addresses darkness, hope, the need for support, intimacy, fear, and the breaking down of boundaries, whether that’s place or gender or anything else that potentially keeps beings at distance. clay and mould making, amongst others. I say (and through me, my characters) makes sense and the world I create also makes sense, in its own very unique way. But that it also leaves something strong behind it too. Working with other people can be scary; there is a sense of responsibility, and a need for clarity when asking for things, which means you need to know what you are asking, what you are looking for. 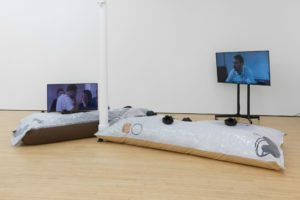 Incorporating a performance and a relatively large-scale installation within a group show can also be quite difficult, but dealing with it is part of the process, so it’s all very helpful in terms of the struggles! 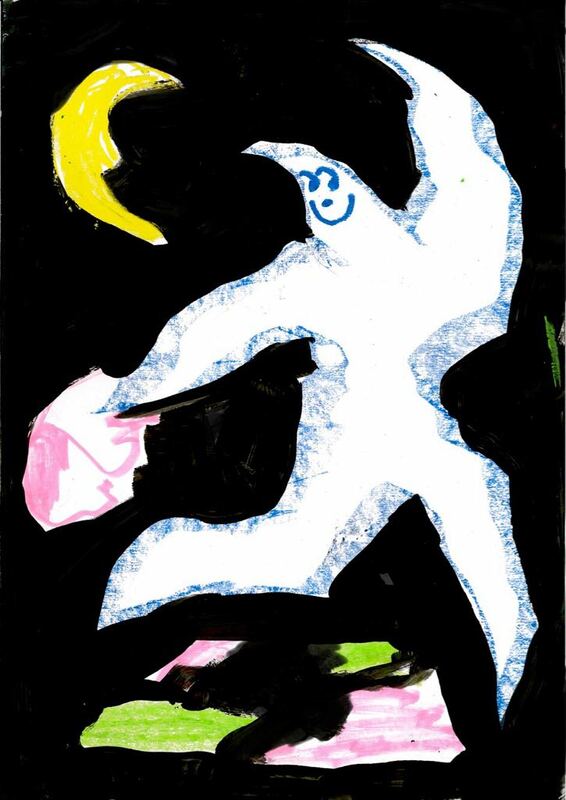 The purpose is to open a window into to the world of the Wild Dog and the Amphibian Owl, and with them, to travel as far away as the stars in the skies, and as deep as the darkest waters. I will be happy if the viewers get carried away within that as much as possible, and with as much trust and care as they can bear.